Another great offering from Overstock.com! Arrived quickly and without any damage. Photos on O.co represent the item very accurately. Overall, very satisfied with my purchase! Thanks, O.co! Safavieh Sete Antiqued White Birch Nesting Tables (Set of 3) - 24.4" x 16.5" x 23.8"
Add a functional touch to any home decor style with the addition of these nesting tables. In crisp white, this matching set is made of sturdy rubber wood that will last for years to come. 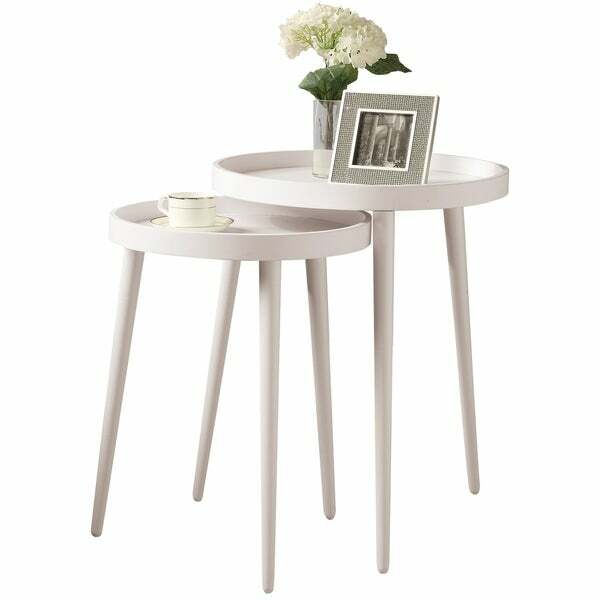 Ideal place for a cup of coffee, remote control, glass of wine or mobile phone, this handy pair of tables are perfect for versatile living or bedroom use. Lightweight, made of rubberwood and radiant in their whitewashed good vibes, this happily nesting pair are durable, fun, flexible, and always there when needed. Dimensions 19.75 In. X 19.75 In. X 24.0 In. Wanted a minimalist side table. I like a tripod table and I was happy to find this set with two tables for a good price. The box was pretty banged up when it arrived and I was a little scared to open it. But the individual pieces were well packaged and wrapped and there was no damage at all. Couldn't be simpler to screw on the legs. Beware if you have small kids or pets, the design isn't the most stable. The materials are commensurate with the price, not the best, but a good value. It was a good buy for me and I'm happy to have my new tables. I bought these tables back in August and the legs fell off less than a week after I received them. They were extremely poorly constructed and each leg would fall off completely at the slightest pressure, despite having 4 screws to hold each in place. For both tables, I had to redrill holes and reattach the legs at a slightly slanted angle to avoid the previously made holes. This didn't help at all because the cardboard portion where the legs attach to the table (that you drill into) is of extremely poor quality. Would've loved to return these but it wasn't even worth the effort to repackage and send it back because I bought them on sale. Absolutely garbage, had to throw both tables out within a month of getting them. DO NOT BUY. These tables are beautiful & were packaged safely with no damage. The only reason they are not 5 star is that they are really light and can tip. These are not heavy duty...but for my space that was okay. This set is ideal for tight spaces and easy to keep clean. The larger of the two tables has collapsed within the first week of use. Very poor quality. They look nice enough, but they are very poor quality. We have used one of the tables only once and already it is scratched. These looked nice but the pre-attached hardware was not secure and two legs on the smaller table fell off... Tried to fix and kept breaking. Returned. modern, light weight, easy to assemble and great value! These broke within a month. Screws are twrrible and legs fell off. My choose was based on design, color and fit with my space. "What is the diameter of the lower table? Also 17"?" Hello jamiemichelle2, the measurements for this lovely item is approximately 24 inches high x 20 inches wide x 20 inches deep. The smaller table is approximately 21.5 inches high x 17 inches wide x 17 inches deep. Thank you for shopping with us.